The Historian gave an old story a new twist. It's a long-long-long narrative about vampire hunting. Not just a vampire, but the vampire--Count Vlad of the Order of the Dragon (aka Dracula). First, a little bit of summary. A lady (which remained nameless all through the book) recaptured a chapter in her life when, as a young woman, she followed the trail set by her predecessors (her father and her father's post-graduate supervisor) in their hunt for Dracula. The quest extended for three generations (1930's-1950's-1970's), that's why I said that it's a long-long-long narrative. The woman told her story, which included his father's telling his own past experience, which included the memoirs of his supervisor. Confusing? I wouldn't blame you. Reading the book, there were moments when I had trouble keeping track of who it was that narrated the sentences before me. Really, it took full concentration to read the book. It was the discovery of an old, mysterious book that lured each narrator (the girl, his father, her father's post-grad supervisor) into finding out all about Dracula, even going so far as attempting a quest in search of him. Save for the picture of a dragon with an inscription of "Dracula" halfway through the book, it didn't have any writings. In my opinion, The Historian is good enough a story in that it had the power to captivate its readers (eg: me). Unless there's something more pressing that needed to be done immediately, I found it difficult to stop reading the book. That's just how skillful Kostova was at weaving her tale. Regardless its title, The Historian--referring to Dracula's keenness in keeping the chronicles of men by means of keeping a private library--merely used historical facts as ornaments. These facts, I think, were not really important for moving the story forward. Let me explain. 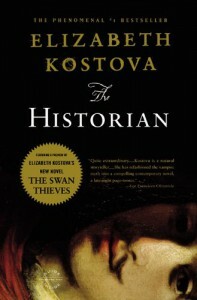 There were a bunch of historical facts in The Historian it's obvious Ms. Kostova had done her research splendidly. However, even if she didn't incorporate them in her book, it wouldn't do story any harm. The story could still go along smoothly, just less interesting. Another pet peeve: too much coincidence. So much, in fact, that even I manage to notice them. (I'm not usually that attentive.) It seems that wherever the girl's father went to--a foreign city with a population of one million, or an international congress discussing a topic completely unrelated to Dracula--he would always meet people that possess the same mysterious book. (Kind of like The Celestine Prophecy, if you know what I mean.) He's also very lucky to always find the documents with information necessary to continue his investigation, always in a short period of time. Even the grand closure, the slaying of Dracula, felt accidental. Isn't it quite spectacular that two people who had just arrived--in a timely manner, by the way--at the spot, were capable of successfully organizing the perfect ambush to beat an extremely intelligent character who had outsmarted his enemies for almost half a millennium? Overall, The Historian is worth the read, especially if you like adventure novels with a sprinkle of history.